The latest on why water is so important, how much we should consume, how to know dehydration symptoms and how to increase your intake with yummy treats! Now that January is upon us, everybody is trying hard to keep their New Year’s resolutions to exercise, eat healthy etc. 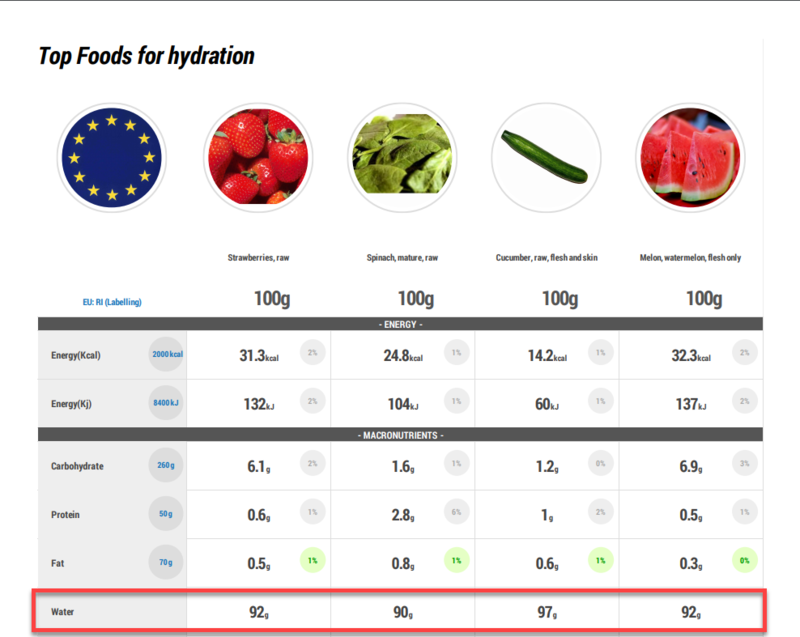 It's worth remembering while training/attending the gym, and healthy lunch prepping this January, that adequate hydration optimises results. Water makes up 60% of our body and is vital for normal function of every cell, tissue and organ. Not only is our body temperature regulated by using water, it is also necessary to absorb essential nutrients from food and carry them around the body. Sweating and urination are crucial functions in getting rid of waste products from the body which also require water. Basically, the human body depends on water to undergo every function. How much water should I consume? Needs vary by individual, but there are some guidelines available to ensure you consume enough fluids. The following show the government recommendations for Australia, Ireland, The UK and The US. Water, tea, coffee and low sugar/sugar free drinks all count as a ‘fluid’! Bare in mind, the volume of cups differ from country to country. From looking at these four territories, they all recommend around the same amount of fluid intake per day. So, if you aim to consume about 2 litres of fluids per day, you are on the right track! The more active an individual is, the more fluid will be needed to replace fluid lost as sweat. How do I know if I am properly hydrated? A scale of yellow tones are used in the urine hydration chart. A linear relationship exists between urine colour, specific gravity and osmolarity of the urine. 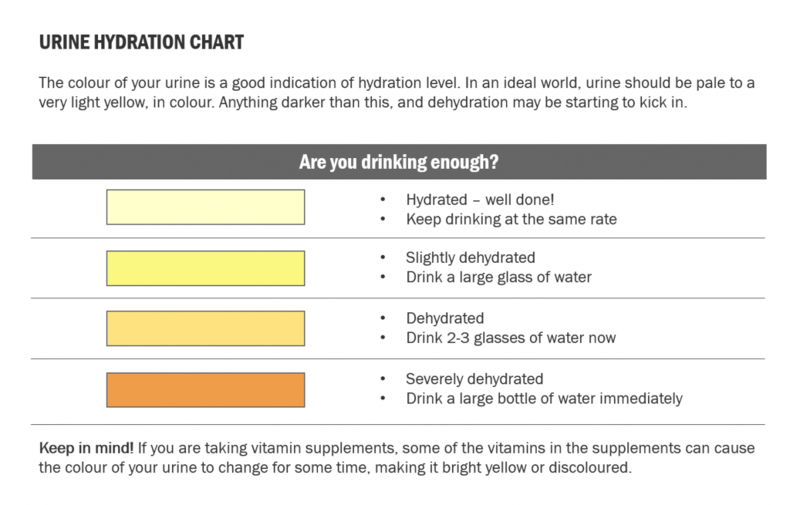 Take a look at the Urine Hydration Chart below! As drinking the recommended daily amount of water can be challenging to some, we must remember that food actually accounts for a significant portion of our fluid intake, too! Watermelons are a whopping 92% water. At 97% water, cucumbers are a cool refreshment to consume, while boosting your Vitamin K and B6 levels. Spinach is made up of 90% water, making it a vitamin bursting snack. Strawberries are a tasty treat comprised of 92% water. So there you have it; why water is so important, how much we should consume, how to know the symptoms of dehydration, and how to increase our water intake with yummy treats! Guidelines are useful, but remember to always listen to your body! When you feel thirsty, you are more than likely already dehydrated. So why not make it part of your goals for 2019 to stay on top of your hydration!? Did you know, you can help your clients to track their fluid intake with our mobile app, Libro? Learn more about Libro here. Shirreffs SM. Markers of hydration status. European journal of clinical nutrition. 2003 Dec 18;57(S2):S6. Food Safety Authority of Ireland. Scientific recommendations for healthy eating guidelines in Ireland. Food Safety Authority of Ireland; 2011. National Health and Medical Research Council (Australia). Eat for Health: Educator Guide: Information for Nutrition Educators. National Health and Medical Research Council; 2013. Institute of Medicine (US). Panel on Dietary Reference Intakes for Electrolytes, Water. DRI, dietary reference intakes for water, potassium, sodium, chloride, and sulfate. National Academy Press; 2005. Armstrong LE, Armstrong LE. Performing in extreme environments. Champaign, IL: Human kinetics; 2000. Armstrong LE, Maresh CM, Castellani JW, Bergeron MF, Kenefick RW, LaGasse KE, Riebe D. Urinary indices of hydration status. International journal of sport nutrition. 1994 Sep;4(3):265-79.